Aberdeenshire-based members of the Unison trade union have written to the SNP minister demanding parity for non-teaching workers. They said that education was delivered by “one team”, which includes classroom assistants, additional support workers, librarians, clerical staff, janitors and catering and cleaning workers – and that they also deserve “fair pay”. Last year, the Scottish Government agreed a bigger pay increase for teachers than the deal secured for other local authority workers. Unison says the same outcome is possible this year. Teachers have been offered a 3% pay rise but teaching unions have demanded 10%. Inez Kirk, Unison branch secretary in Aberdeenshire and Scottish local government negotiator, said: “Last year Mr Swinney found more money to give teachers a bigger increase than other local authority workers, despite us all contributing towards the education of Scotland’s children. “We don’t think that was fair. 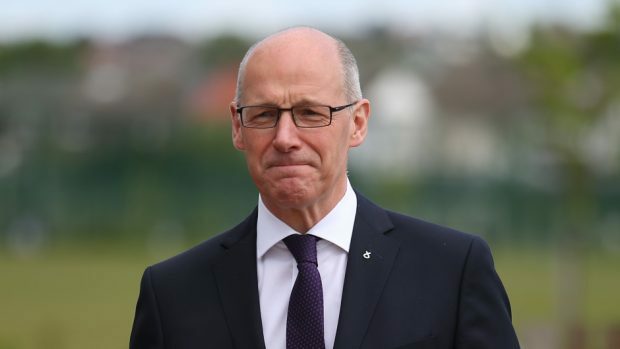 Johanna Baxter, Unison’s head of local government bargaining, added: “John Swinney cannot deliver on his education reform agenda without the contribution of our members. Last night a Scottish Government spokesman said it was not involved in talks over the pay of council employees. “Ministers value and recognise the contribution of all staff who work in schools,” he said. “However, pay for local government employees, other than teachers, is negotiated between the unions and Cosla and the Scottish Government is not part of that process. “This year we are providing local authorities with a revenue funding increase of £174.9 million.